A concentrated Onion paste made out of minced onion sautéed in Refined Vegetable Oil providing sweet clean flavour and aroma of sautéed onion. Onion paste is a staple of Indian cuisine and is most commonly used to thicken and flavour sauces. Onion, refined oil, Salt, Water, Stabilizer (E415) Contains permitted class-II Preservative (E 211) . We are one of the reputed organization engaged in providing superior quality Onion Paste. It is made from carefully selected fresh onions ensuring quality product. Its unique process maintains fresh aroma and taste making the cooking experience pleasurable. It is specially formulated for dishes like Indian Curry and etc. This paste is additives for many dishes for more delicious and appetizing. Manna Sautéed onion paste is made from carefully selected fresh onions and sautéed in sunflower oil. This onion paste saves time and enhances the taste of your dishes. No added coLour or preservatives. This pungent, aromatic paste imparts fiery hot taste to food. It can be made with either boiled or fried onions. Never make a paste of raw onions if you want to keep it for any amount of time. It will turn bitter. 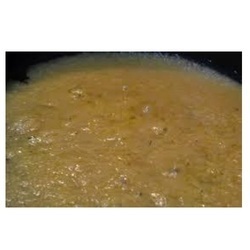 The Onion-water ratio is crucial to this preparation as excess water will make a thin puree and if water is not enough, the onions will remain uncooked. Onions act as anticoagulants, also known as blood thinners, which in turn prevents the red blood cells from forming clumps. These blocks and clots can lead to heart disorders or cardiovascular diseases. We are one of the reputed organization engaged in providing superior quality Onion Pastes. These Onion Paste are good demand in the market due to high quality and durability. These products are available in market at competitive rates. We are the prominent organization of the market immersed in supplying Onion Paste. Grinded at our unit by the use of pure onion, these pastes are more effective and make different meals tasty. Our paste is safe to for longer life. Healthier in nature this product of the firm is praised by the consumers due to perfect taste. We supply hygienic, onion paste of best quality onion. We produce hygienically made Onion Paste that is a pungent and very aromatic paste made of freshly procured onions and is so packed that it can sustain fresh for quite longer period of time. While preparing this we undertake keen attention to the onion-water ratio so that it would neither be very thin puree like nor it would be dry lumpy. We are leading manufacturer & exporter of Onion paste / Cooked Onion paste / Brown onion paste in bulk packing for Food industries. in 220KG drums.